I recently received a message from my brother. It said ‘Can I write an article for you?’ Now, considering he’s 11,000 miles and 13-hour time difference away, travelling in New Zealand, I was a little taken aback. And no – unfortunately he can’t write an article for me. But I’m going to tell you why he wanted to. It all started with a burger – specifically “the. best. burger. in. the. world.” according to him. The best thing he ever ate, that would apparently stop all my ‘veggie nonsense’. Turns out he had just eaten at Fergburger, which is a famous Burger joint in Queenstown. But it got me thinking, what is it about burgers that sends us so crazy? I feel like every city has a restaurant claiming to have the best burger in the world. Is it the combination of meat, bread, and cheese? Is it the numerous possible flavour and topping combinations? Is it the fries on the side, or the ‘eat with your hands and get grease all down your chin’ vibe? Is it the gherkin?! It’s such a universal dish that you’ll see on almost every menu. And whilst my brother seemed to truly believe that the Fergburger is the best in the world, I, as a recent vegetarian, will not know this pleasure. I did, however, recently get to try Honest Burgers’ vegan burger, a collaboration with ‘Beyond Meat’. And boy, did it deliver. 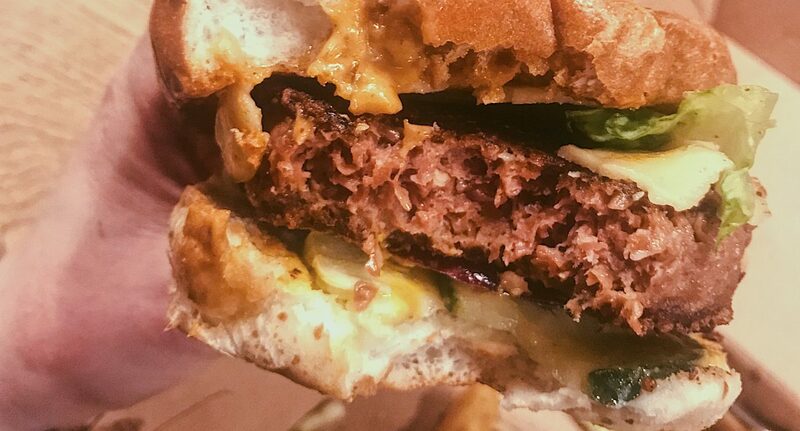 Made from chickpea shells for the texture and beetroot for a medium rare look, the beyond meat burger was truly convincing. The smoked gouda (which actually melted, which can’t be said for most vegan cheeses) and rosemary-salted fries were a welcome accompaniment. Honest Burgers are opening in Manchester this April. I really do insist you go. Plant burger or meat burger, it’s bound to be great. 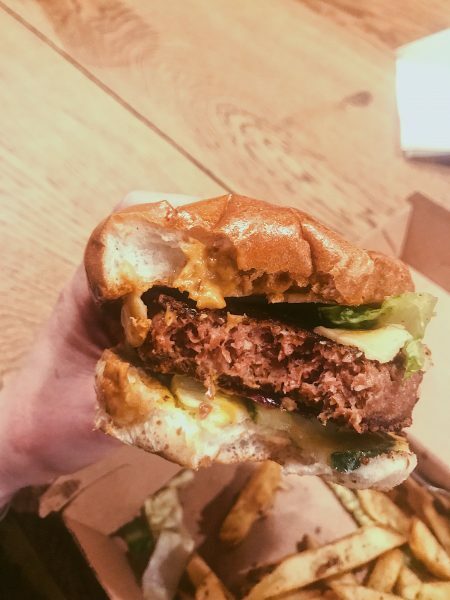 After asking around, I found a huge array of answers to the question: ‘what is the defining factor of a great burger?’ These included; good burger sauce, quality of the meat, structural integrity, (relevant to most veggie burgers) and a good cheese melt. For me – controversially – it’s about the bun. I can’t be doing with brioche buns (too sweet), sesame seed buns (too messy) or pretzel buns (I mean come on). I want a good, white bread that’s firm enough to hold the burger but not so crispy that it’s difficult to eat. We all know the pain of taking that first bite only to find a soggy mess in your hands, or going for the burger and managing to only get bread. I don’t think the perfect burger really exists, because as those responses show, we all want different things. But one thing I have learned is that is doesn’t matter. No one cares why burgers are so great, they just are.